The movie will hit Chinese theaters on July 13. Rooted in Buddhist mythology, the film is set in a fictional world ruled by six regimes, including the titular realm ruled by a greedy, three-headed king (also named Asura) who hatches a scheme to invade Tian (heaven), a sacred land and a symbol of goodness and truth, before colonizing the universe. A hundred years after the king failed in a bloody war against Tian, which saw him lose one of his heads, a young herdsman－played by 19-year-old actor Wu Lei－not only turns out to be the reincarnation of the lost head but, more importantly, the hero chosen to rescue the world. Tony Leung Ka-fai, four-time best actor winner at the Hong Kong Film Awards, and veteran Hong Kong actress Carina Lau Kar-ling, star as the heads representing desire and strategy, respectively, while Wu stars as the head symbolizing insight. Producers reveal that they had to develop a specific program to "graft" the heads of Lau and Wu onto the neck of Leung to digitally create the character of Asura, who has three personalities. "It's a very imaginative movie. 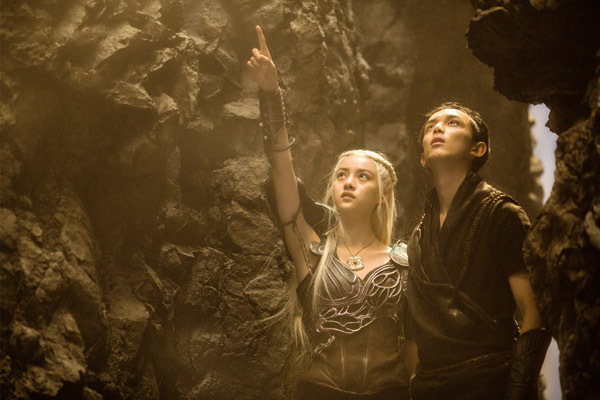 We wanted the film to raise confidence in our own culture and train more domestic talent," says Yang Hongtao, chairman of Ningxia Film Group, one of the film's financers who is known for producing the hit franchise Painted Skin, a fantasy tale about a fox spirit that transforms into a beautiful woman. Chinese fantasy epic Asura has ambitions to rival any Hollywood blockbuster.